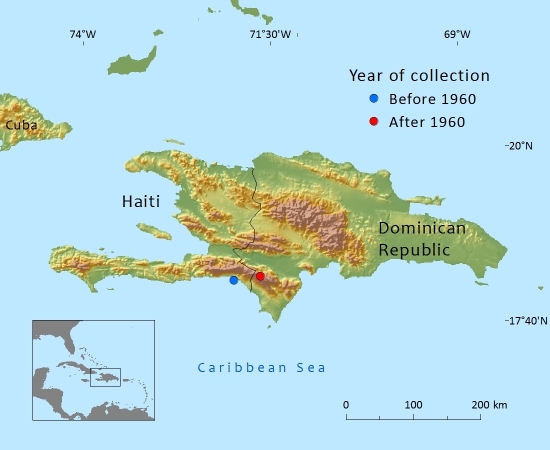 Occurs in the Dominican Republic and Haiti where there are less than 250 mature individuals; main threats include fire and overgrazing by livestock. Very limited distribution on Hispaniola. Haiti, Massif de la Selle (Pic la Selle), near the summit on limestone formation at an altitude of 2300–2500m where there are ca. 30 plants (Adams, 2010). On the adjacent part of the Dominican Republic, Sierra de Baoruco, in a field at 2100m above sea-level, here not exceeding 250 plants. Restricted to limestone. On Pic la Selle this variety occurs on a slope at around 2500m above sea-level on a slope; in the Sierra de Baoruco it grows as isolated patches in a grassy open plain at 2100m and surrounded by forest. The recent discovery of this variety at a locality within a national park in the Dominican Republic appears to take the status out of Critically Endangered, where it would otherwise belong based on Adams’ count of about 30 plants at Pic la Selle in 1996. 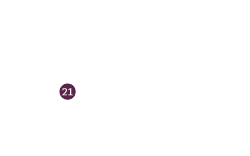 However, although the newly discovered sub-population is larger (but uncounted it seems), in total it is not likely that the population in these two locations exceeds 250 individuals. Forming creeping ‘mats’ it may not always be obvious where an individual plant ends and another begins. Under the D criterion, it is therefore assessed as Endangered. The main threats are fire, especially at Pic la Selle, and possibly overgrazing by livestock. The sub-population at Pic la Selle is declining, but there is no decline observed in the subpopulation in the Sierra de Baoruco. This latter sub-population was discovered very recently. Farjon, A. (2013). Juniperus gracilior var. urbaniana. In: IUCN 2013. IUCN Red List of Threatened Species. Version 2013.1. <www.iucnredlist.org>. Downloaded on 06 July 2013. A.Farjon,and M.F.Gardner, 2013. Juniperus gracilior var. urbaniana, from the website, Threatened Conifers of The World (http://threatenedconifers.rbge.org.uk/taxa/details/836).